Eukanuba Healthy Start Kitten is 100% complete and perfectly formulated cat food for growing cats. The food is developed together with vets and is tailored to the specific needs of cats from 1 to 12 months old in the growth phase. The ingredients are of a high quality with vital nutrients to properly support your kitten's growth. This feed contains DHA to support a developing brain, the immune system and your kitten's eyesight. The protein is made up of 91% animal proteins from chicken and turkey, which can be easily absorbed to build and maintain sleek muscle. Added vitamin E provides antioxidants to support your cat's vitality and well-being. This helps strengthen the immune system and the body's natural defences. Cats feel better when their digestion is in harmony, which is provided by special prebiotica like FOS and dietary fibres. Sugar beet pulp also helps with effective nutrient absorption. Low magnesium content also helps keep the urinary tract in good health. An optimal balance of omega 3 and 6 fatty acids can improve quality of skin and fur, giving your cat a wonderful glow. For healthy development of strong teeth and bones, the calcium in this feed contains plenty of valuable minerals. The size and shape of the kibble is adapted to suit smaller jaws and help your kitten get the best from all of its food. 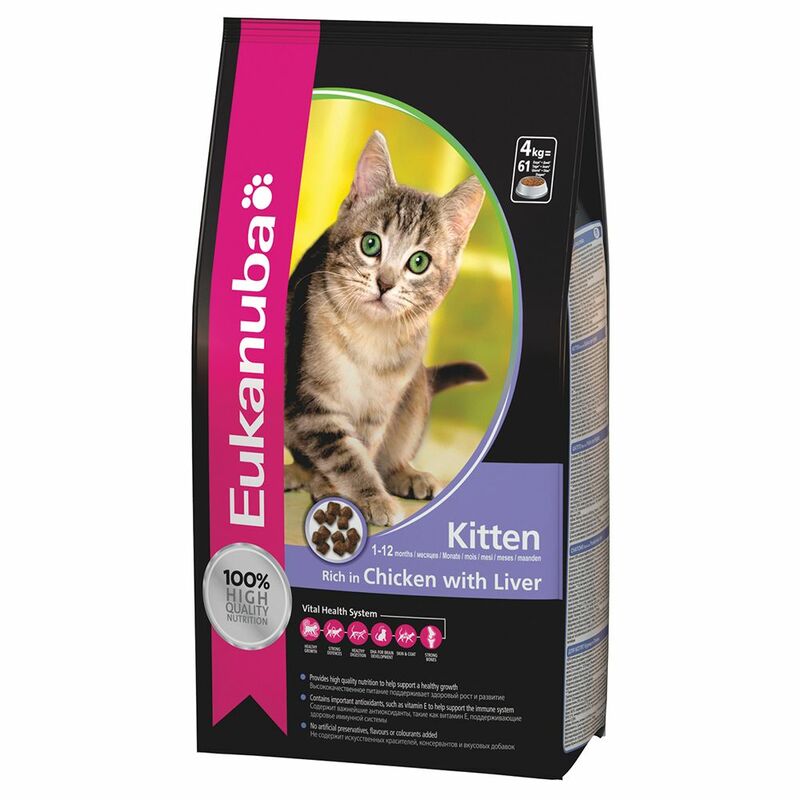 Eukanuba Healthy Start Kitten contains no added artificial preservatives, colouring or flavouring. Eukanuba Healthy Start Kitten at a glance: Complete feed for growing cats from 1 - 12 months old For harmonious growth and healthy development 100% balanced and high quality: ideal for their specific needs 91% animal proteins: out of the total proteins for easy absorption, and development and maintenance of sleek muscle Healthy growth: high quality ingredients and added DHA support development of the brain, immune system and eyesight 46% meat: top quality chicken as a main ingredient Vitality: strengthens the immune system and the body's natural defences with healthy antioxidants from vitamin E Harmonious digestion: Prebiotics such as FOS and special dietary fibre can support intestinal health, and ensure a balanced intestinal flora. Sugar beet pulp can promote effective nutrient absorption Skin and Fur: an optimal balance of omega 3 and 6 fatty acids for healthy skin and gloΒy fur Strong teeth and bones: special kibble is shaped to the kitten's mouth to make it easier to digest nutrients due to important minerals and calcium Developed together with vets No artificial additives like preservatives, flavouring or colouring. Price just £20.99! Click here to buy now!